Hey there! How has your week been?? I've been taking things slowly lately. After a few really hectic weeks, my body just needed a major reset. Over the weekend, Reuben and I lived our best homebody lives. We finished Queer Eye in a day, caught up on the craziness of West World, and made pizza (Reuben made it while I melted on the couch). Speaking of couches! We did manage to leave the house for some fresh air and some West Elm research. Our TV watching spot is about to get a nice upgrade! Oh, and we also went over to our good friend's parent's house for a beautiful dinner party full of cheese, clams, and Polly Ann Ice Cream. It was the best! It's always so nice to have someone else prepare an great meal for you. Alex's parents have a house in the Inner Richmond, so not to far from us, and it is the most beautiful place. If you dream of the ideal San Francisco home, this is it. Bright, sunny, breezy, charming, and with a backyard full of plums and other tasty things. I wonder if they would let me move in?? The weekend was everything that I needed it to be. Calming. I feel like with all the travel and craziness over the last 6 weeks, I've fallen out of my daily rhythms. 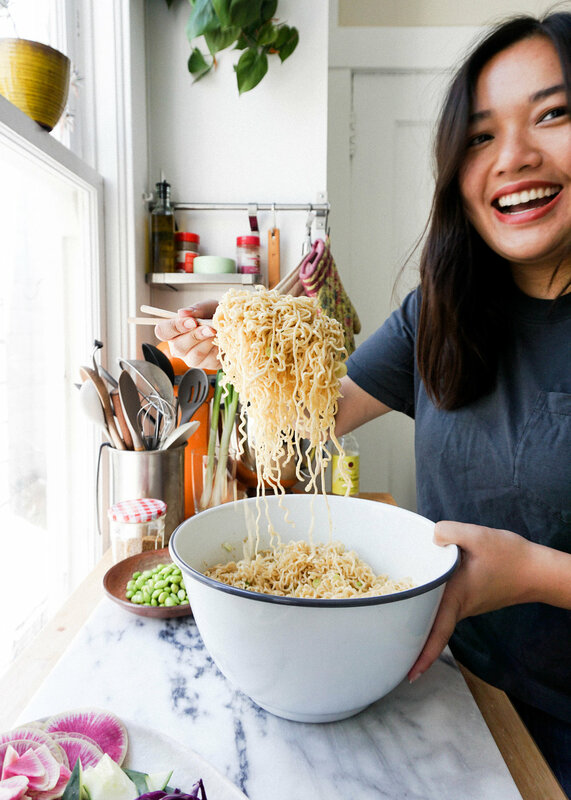 Since I typically have a bunch of things happening at the same time, whether that's balancing work with blogging or the handful of other side hustles or just managing to make dinner most nights, I need daily rituals to help ground me. For a solid 5 months I was really good at getting up early enough to make myself breakfast and a matcha latte. I'm not a waking up person... but once I'm awake I'm a morning person... if that makes sense. I always look forward to the morning so I could plate a pretty bowl of yogurt and whiz up a frothy and warming matcha latte. Those 15 minutes of calm and focusing on one simple task helped me set myself off on the right foot each morning. I've finally started getting back into that rhythm this week. Well not this morning, because I had to wake up at 4am to drive 1 hour for a 6am meeting... 6am meetings should be illegal, right??! But other than this morning and some sick vibes I've somehow combatted, I'm feeling good. Good thing too, because I need to get back into the kitchen and share some real food with you guys and not just popsicles and matcha lattes! This matcha latte is the best though. I promise! I posted an iced matcha latte recipe about a year ago and honestly, you can ignore that recipe lol. I've learned a lot about matcha and how I like to make own matcha latte at home over the past year. When I first had matcha, it tasted like seaweed to me... but eventually I got over that or maybe I've found better tasting matcha since them. If you're looking to purchase matcha powder I highly recommend Mizuba Tea Co. or Ippodo. I currently have Mizuba Culinary Organic Matcha in my kitchen and I really love it. The color is super bright green and the flavor is strong. I like to buy culinary grade matcha because I can bake with it too. You really shouldn't waste ceremonial grade matcha on baked goods. If you do buy it, make sure to store your matcha in a dark place, otherwise the sun with cause your matcha to turn a little pale green grey. I learned that the hard way! My secret ingredient to Cho Best Matcha Latte is vanilla infused agave syrup. I've had many coffee shop matcha lattes, but the best one I've ever had was from this random coffee shop up in Tahoe. I can't even tell you the name of it right now. But I asked them what they put in theirs because it just tasted so unbelievably good. Sweet but not too sweet. The matcha flavor was strong and not diluted from too much milk or water. And there was an interesting flavor I just couldn't put my finger on. The coffee shop told me they used vanilla agave syrup! Such a good idea! Infusing the vanilla bean pod in the agave gives it a really beautiful, light, and almost floral vanilla flavor to the latte. It also works great in regular old coffee! I tried it this morning. Coconut butter is another secret ingredient I've picked up. It adds a really lovely coconut flavor and also helps make the latte extra thick and frothy without all the extra milk! I sometimes add collagen protein powder or maca powder for some extra health points, but you can experiment with whatever you like! Add a little dash of pumpkin pie spice in when October comes along. Another secret tip for making Cho Best Matcha Latte is using a blender! Don't be ashamed. It's is like a million times faster than whisking it by hand, frothing your own milk, and then artfully combining everything. I love my quiet mornings. But I don't have hours to spend at home doing it all at a snail's pace. While my water kettle is boiling, I prepare everything else in the cup of my immersion blender, and then whiz it up for a minute once my hot water is ready. It's crazy easy. You can save the matcha whisk for a special occasion or if you want to fit in a morning arm work out. *** Also happy birthday to Reuben's Mom today!!! and happy birthday Cho Momma tomorrow!!!!! Yay, Moms! Split the vanilla bean with a sharp knife lengthwise, careful to not cut the pod all the way through. Scrape out the vanilla "caviar" and mix with agave. Place the scraped bean pod in the agave as well. Seal up the jar and allow the vanilla bean to infuse for at least 24 hours. Remove the pod after 3 days and store the agave in a cool dry place. Combine warm milk, just boiled water, matcha powder, coconut butter, and vanilla agave in a blender or vessel for an immersion blender. Blend for 1 minute until frothy. Pour into your favorite mug and enjoy! Combine hot milk, matcha, and agave in a blender or vessel for an immersion blender. Blend for 30 seconds. Pour over ice and add in milk. I took a mental health day on Friday. Do you ever take those? I feel like it should be a lot more socially acceptable to tell your coworkers "Hey, guys. I need to just not talk to anyone today about ADA signage or mechanical coordination and spend the day in soft pants doing things that make my soul feel alive." I should have put that in incredibly tiny text at the end of my "Home Sick" email. To be honest, my office is pretty great and I imagine would be totally understanding of me taking a day for myself. But it still feels weird, you know? I feel like I am constantly juggling a million things. I have a full time job. But there is always a side project to be done. A recipe to be tested. An event that I should probably go to. A person I need to meet or catch up with. A mountain of dishes to wash. Gosh. So. Many. Dishes. Oh, maybe go to the gym a few times to balance all the food! But in an odd way, I love being a busy bee. I get so much satisfaction from checking everything off my to-do list and operating at maximum productivity. It takes a lot of work and an incredibly detailed google calendar. Most of the time, I feel like I maintain a pretty good balance. But that balance has been slowly slipping away the last 2-3 weeks. As each hectic day passed I could feel myself slowly unraveling. You know how you get that lump in your chest that just gets a little heavier and heavier? Like a lot of people, I suffer from anxiety. Granted, my anxiety is not as severe as a lot of other people's anxiety. But it is definitely something I have had to learn to manage. It thankfully was not an issue when I was kid, but it definitely started to develop when I went to college and more so now that I'm like a sort of independent woman trying to make my dreams come true. My anxiety stems from a fear of not achieving enough and not pleasing everyone. So it is sort of a blessing and a curse. It gives me a push and drive to do all things I want to do. But it also leaves me feeling incredibly upset and restless if I feel like I just wasted an entire day doing nothing except watching Queer Eye all day. Or if I have to say no to a friend, it tears me upside. So I've been trying to remind myself that it is okay to slow down, to say no, and to just take time for myself and do nothing. Otherwise I would go insane. On a day to day basis I try to make time in the morning before work to make myself a nice breakfast and matcha latte and enjoy a moment of calm before heading out to work. It's my time. Then I do the same during dinner, chopping lots of vegetables is my form of mediation. But lately, I've been just skipping breakfast and calling an uber pool to take me to work because I'm already running 45 minutes late for work. It creates a really frantic start to my day and then it gets mixed up with work stress and side project stress... it's not awesome. 7:30am- Wake up, scroll through instagram, kiss Reub goodbye for the day. 8:00am - Watch some morning tv and drink a matcha latte. 8:30am - Walk down clement street to do some grocery shopping. 9:30am - Make and photograph a savory dutch baby for the blog. 10:30am - Eat a small slice of dutch baby, text Reuben how incredible it is. Save the rest for dinner. 11:00am - Prepare a bowl of veggie heavy instant ramen for late breakfast/early lunch. 11:30am - Veg out on the couch and watch Netflix. 1:00pm - Get a craving for chocolate. Put on pants and walk to Arsicault Bakery to buy 3 different croissants. 2:00pm - Stop by the plant nursery and buy 2 new plant babies. 2:30pm - Veg out some more on the couch while watching a Fixer Upper marathon and eat a chocolate croissant. 4:30 pm - Call my Momma! 5:30 pm - Start a terrible that is too embarassing to share. 6:30 pm - Reuben comes home, tell each other how our days went, and get ready to go out for a friend's birthday. That was my day and it was freaking awesome! I was so happy, I couldn't stop smiling! My mental health day really did a lot to help me reset and put me back into balance. I came back to work on Monday feeling so refreshed : ) and so far it has been a pretty good week (it's only Tuesday 😜 ). I hope you all have a calm and refreshing weekend coming up! 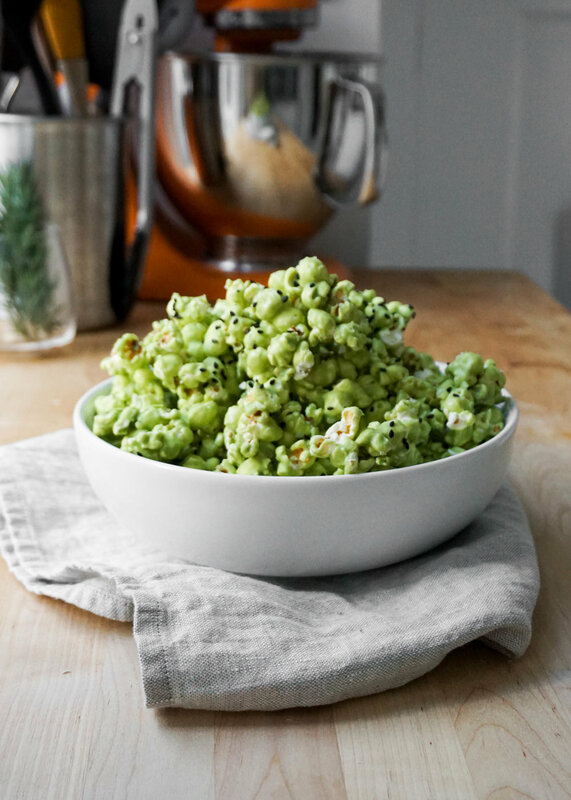 Maybe make some Matcha Popcorn with your best friend! 1. Melt 1 tbsp of coconut oil in a pot over medium heat. Add in one kernel of corn into the pot and cover until it pots. Once the kernel pops add in 3 tbsp of popcorn kernels. Cover and heat for 60 to 90 seconds until all the kernels pop. Immediately place popcorn in a large pot. Repeat steps with other half of kernels. 2. Set up a double boiler to melt your white chocolate. Add enough water in a small pot so that you have 2" of water. Bring water to a slight slimmer. Place a heat proof bowl on top of the pot of water. 3. Add white chocolate and 1 tbsp of coconut oil to the bowl. Whisk the chocolate as it starts to melt. Add matcha powder and continue to whisk until the chocolate is completely smooth. Remove from the heat and allow to cool for 5 minutes. 4. 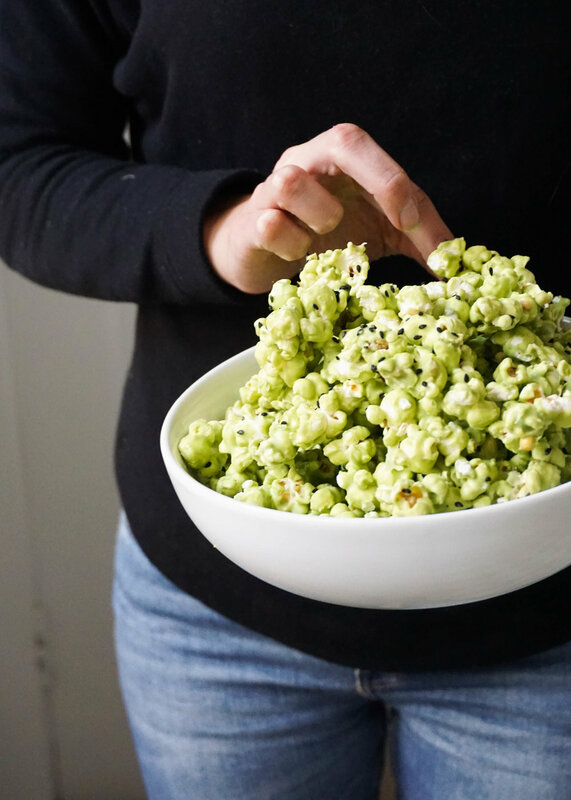 Drizzle matcha white chocolate mixture over the popcorn and gently toss the popcorn to coat. 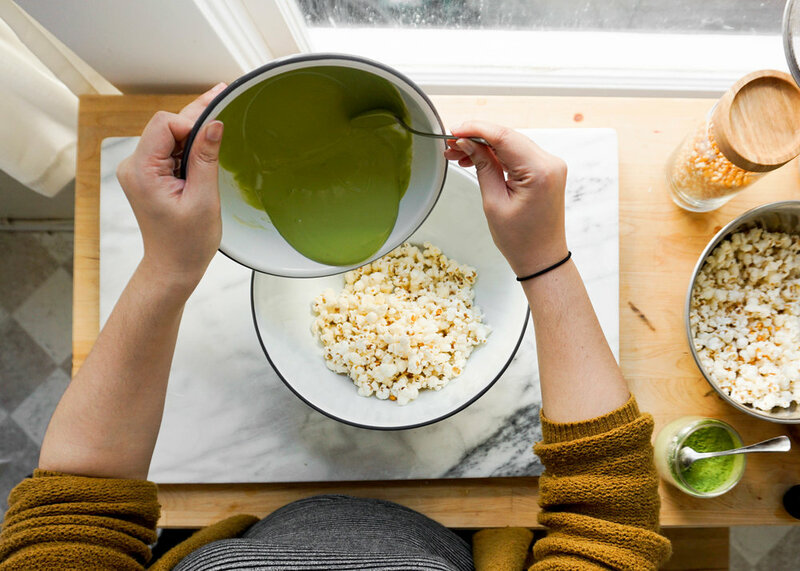 To make things easier, you can coat the popcorn in two batches. 5. Line a baking sheet with parchment paper. Pour the coated popcorn on the baking sheet in an even layer. 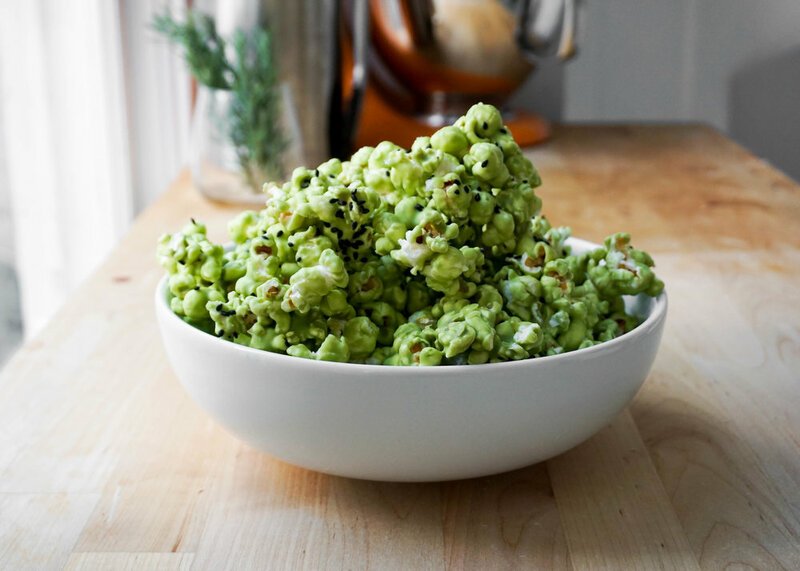 Sprinkle flakey sea salt and black sesame seeds over the popcorn. Place in the fridge and allow to chill for at 2 hours, until the chocolate has hardened. 6. Break into smaller pieces and enjoy! Happy Saturday y'all! And hooray! for a glorious 3 day weekend! I hope you all have stellar plans for the weekend, even if it is just lounging around in your living room, wrapped up in a blanket like me. I just completed my first week of work at my new job.... and I am pooped. So I'm going to try to relax as much as I can this weekend. Reuben and I might go on an Oakland Beer adventure tomorrow (have you started following @beermeatsbread yet? ya should) and I might make a roast chicken. Might. I'm pretty content with keeping my physical energy usage to a minimum this weekend. In a couple weeks I think I'll feel comfortable enough to bring in my baking leftovers. I've been sending them to Reuben's office while I've been without an office and coworkers. He brought in these Matcha Coconut Macaroons the other week because I was having a hard time not eating all of them. If you think matcha and black sesame is a matcha made in heaven, then let me introduce you to matcha and condensed milk. They are so beautifully matched. 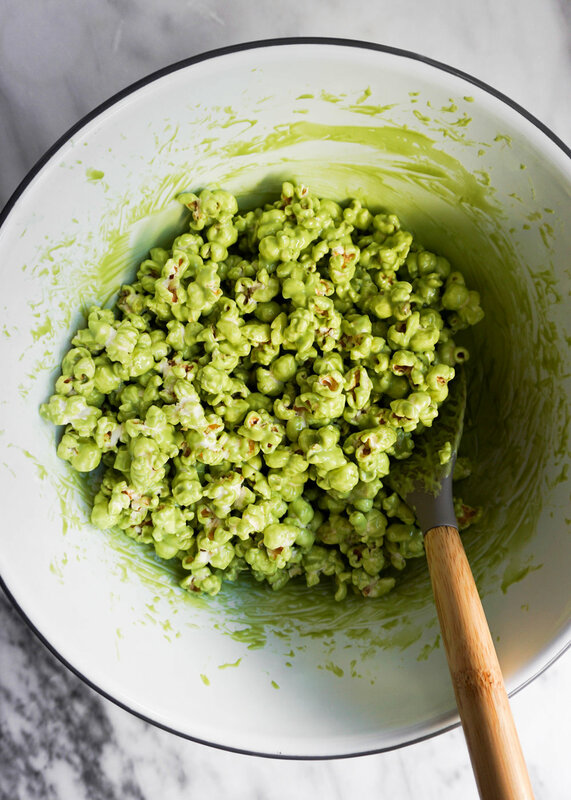 Matcha powder on its own is pretty bitter and really needs a creamy and sweet medium to really showcase the flavor, which makes it a likely swipe right for condensed milk. I want to experiment more with condensed milk. My mom would ways drizzle it on our pancakes, waffles, and toast growing up and it was perfection. These macaroons only take about 30 mins from start to finish AND they are gluten free. Win win, guys! When I'm a mom and dominating the snack day game, I'll be making these all the time. I hope you all have a wonderful weekend and find 30 minutes to squeeze in these addicting Matcha Coconut Macaroons! 1. Preheat your oven to 325 degrees and line 2 baking trays with parchment paper. 2. In a large bowl, stir together condensed milk, egg white, vanilla, salt, and match powder until combined. Gradually add in shredded coconut and stir until evenly combined. 3. With a cookie scoop (I have a medium 1.5 Tbsp size) or spoon, drop macaroons on baking tray about 2 inches apart. 4. Bake cookies for 18-22 minutes until they get golden brown on the edges. Remove from oven and allow to cool on baking tray for a minute, then transfer to cooling rack. Guys, I'm starting a new job next week. Besides working on EatChoFood, hand lettering, and illustrations, I'm actually an architectural designer during the day. Do I sleep? Yes, too much. I'm constantly making to-do lists and updating my google calendar, otherwise I'm an absent-minded hot mess. I'll be a designer at Studio O+A starting this Monday! I'm excited and terrified, but mostly excited!! Leaving my last job at BAR Architects was super bittersweet and I shed quite a few tears saying my goodbyes. It was my very first professional job after graduation and I spent almost 3 and a half years there. I'm so beyond grateful for all the friends and mentors I've gain during my time there, but I'm just really ready for something new and challenging. I'm not completely sure if being an architect is what I want to do for the rest of my life. I'm hoping to figure out a way to combine my love for design, food, and painting into one really rad career. Until that happens, I'm looking forward to learning everything I can from O+A and becoming a better and more creative designer! Since I don't start until next Monday, I arranged a little stay-cation for the rest of the week. My goals for the next week are to relax, organize my mind and my apartment, work on some wedding orders, and test a few matcha recipes! Oh, and watch a lot of netflix... duh. Have you started watching Master of None yet?! It makes me want to make fresh pasta. Back to matcha... I've partnered with Motion Matcha to develop a few recipes with their delicious just matcha powder. I've been daydreaming of matcha cheesecake, swiss rolls, macaroons, babka, marshmallows, so. much. matcha. Do matcha pop tarts sound terrible? The first thing I needed to make was an iced matcha latte since I would be making these all the time. It's so good. I'm personally really sensitive to caffeine. 1 cup of coffee and I'm good for the day, anymore than that and I'll get all shaky and weird. So matcha is the perfect alternative for me because it gives me a gentle energy boost without the caffeine crash. Plus it's healthy for you! Does loving matcha make me basic? I don't really care. I haven't tried a turmeric latte yet though, so that may be my next obsession. You can buy Motion Matcha here. It's great and affordable for the amount of powder you get! One time I accidentally spent $30 on 1 ounce of ceremonial grade matcha in a fancy tea shop in Portland... yikes! So this is a great deal, trust me. Stay tuned for more matcha recipes in the future! 1. In a small bowl, place matcha powder and a splash of hot water. You can adjust the amount of powder depending on your taste preference. I like mine with 2 teaspoons of matcha. Whisk matcha to form a thick paste with either a bamboo matcha whisk, a mini traditional whisk, or fork. Creating the paste helps prevent any lumps in your drink. 2. Pour the rest of your hot water and sugar to the bowl. Whisk vigorously in a figure 8 formation until lightly frothy, about 45 seconds. 3. Add your desired amount of ice to a glass. Pour matcha over the ice and add your milk. I use 2%, but you can use almond, soy, coconut, or any other alternative you like.